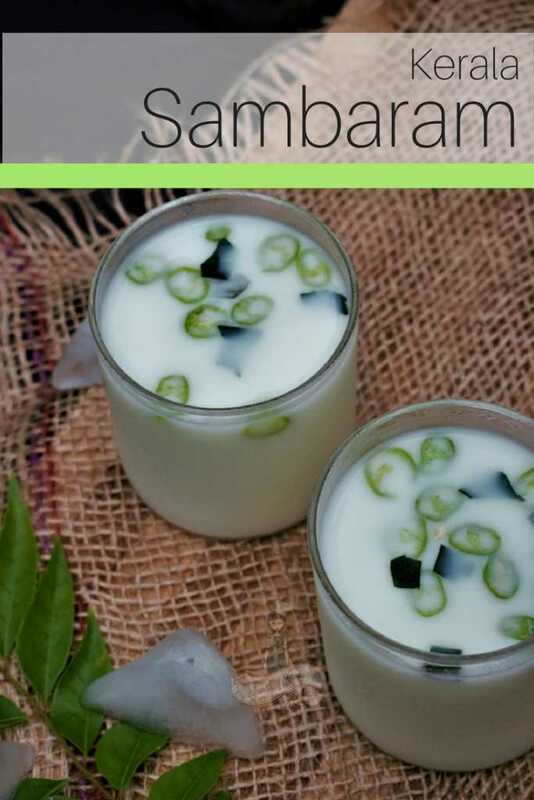 Sambaram is a refreshing summer drink from Kerala, South India. 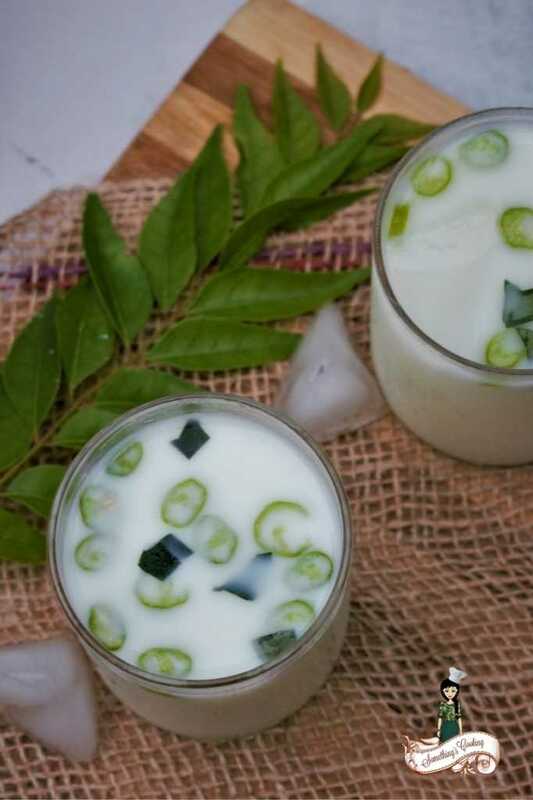 You can say, it is a different take on Lassi and Chaas which are popular in the northern states of India. Sambaram is also served in the exuberant Onam Sadya. I know you might be wondering where I was all these days. A couple of days ago, I had mentioned on my Facebook page that I am dealing with a windowless kitchen. Things have improved, we are settling down at the new station and yes, I have a brand new kitchen! I have missed blogging here and honest to God, I was going crazy without being able to cook and share with y’all. That’s when I decided that I ought to start a new Instagram page just for this little space. I have been sharing some food photographs, live stories, and ‘behind-the-scenes’ since the last few days. My photo of Mackerel Fish Curry was picked up by the Kerala Instagram account which got over 5000 hearts. Awesome, right? I hope you’ll follow me there. Served on a banana leaf, Onam Sadya is a humongous spread of vegetarian dishes. It usually consists of a minimum of 26 dishes of which Sambaram is served at last. It acts as a cooling agent and improves digestion. 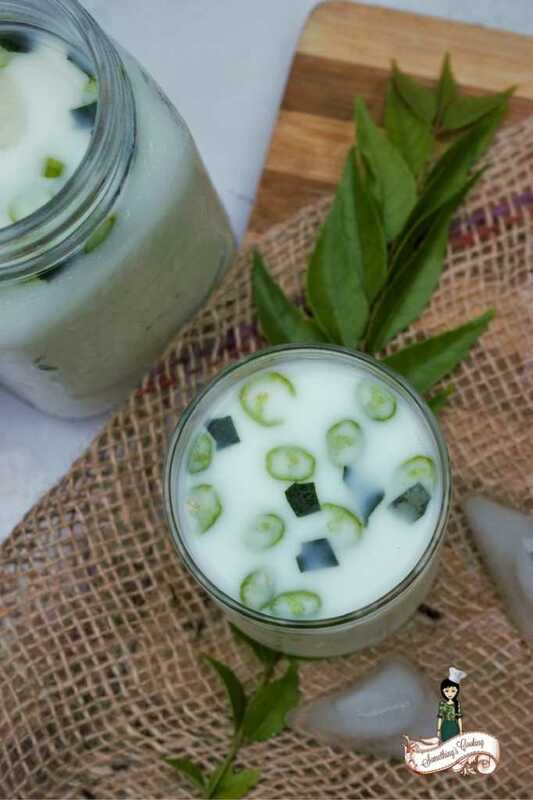 As opposed to the Spiced Cooked Buttermilk which is lightly cooked with spices including turmeric and/or a coconut blend, Sambaram is buttermilk spiced with green chilies, ginger and curry leaves. It is usually cooled in a refrigerator for a few hours before serving. As kids, when sister and I came home playing and decorating the Onam Pookalam aka flower carpet, Mom served us with a huge glass of Sambaram. Traditionally it was also served as a welcome drink in our homes. Our grandparents always had a huge Manchatti aka clay pot filled with Sambaram on the verandah with a steel tumbler. The houseboys after toiling in the sun or any weary travelers who passed by would simply scoop up a tall glass of Sambaram to quench their thirst. Add water and yogurt in a bowl and whisk well. Add minced shallot, ginger, green chilies and salt. Whisk again. You can blend the yogurt and water to form a froth. Alternatively, you can also strain the shallot, green chilies, ginger and curry leaves before serving. You can omit shallot, if you do not prefer. If you do not have time to refrigerate the drink, blend yogurt and water with few ice cubes. Add the rest of the ingredients, and keep aside for five to ten minutes. This helps in infusing the flavor in the drink. Mix and serve. Check out more Onam Sadya recipes here. Pin it! Hie what are shallots and any alternative for that? Ooh I love this! Married into Palakkad has its advantages, on the food front. You make it sound even better with that back story. Oh hey congratulations on the Insta pick. How lovely! And good wishes for the move and settling in. Thank you very much, Mam. Glad to know that you’ve tried this one! Glad your windowless kitchen days are behind you. This is a yummy refreshing drink. We have a slight variation with crushed ginger and a tempering of cumin seeds and chopped coriander too! Congrats on the milestone on INsta- thats just awesome to hear! I havent had this version of the buttermilk but a couple of years ago a Tam Bram friend of mine had visited and while making namkeen lassi, she added ginger and chillies to the mixie and I have been doing this since then as I loved the flavour! I am hoping to have a Onam Sadhya meal somewhere soon – my memories of the last one are just too yummilicious!!! Your ‘Aila meen curry’ recipe has to be picked, the pictures were that brilliant! Strangely, being a mallu I have never heard of Sambaram. I always thought that we only used curd in avial and pacchadi. One question though. Won’t the raw minced shallot leave a weird smell and taste? Oh yes, I hate using shallots in Sambaram. I can’t tolerate the smell. But my family prepares this in the traditional way by including the minced shallots. I would say crush (if not mince) them, add to the Sambaram, let it rest for some time and then take it off/strain. That would do the trick. Ooh yummy. I love buttermilk in all its forms. I am not sure if I wish to add shallots but since the recipe is so versatile, I am sure it is a wonderful drink. Glad that you are settling in well in your new kitchen. This is something I think my husband would love. Me, I think I am happy I do not live in a hot climate. 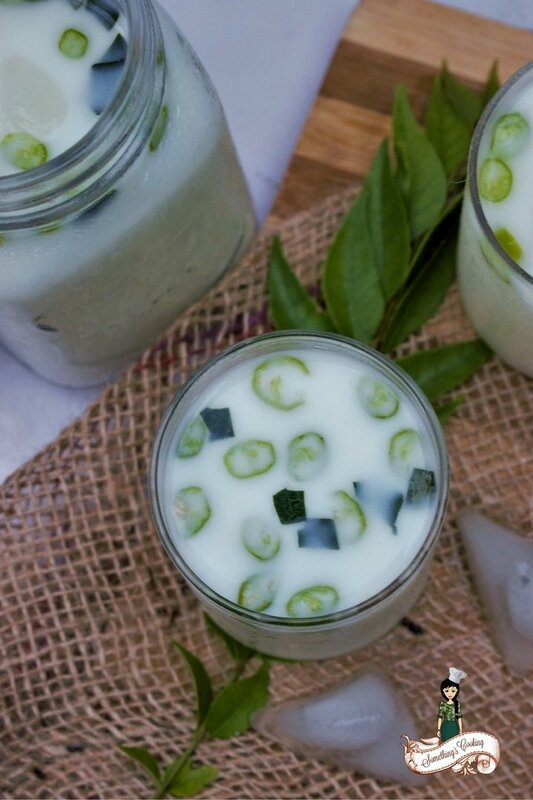 This is one healthy drink, though, between the yogurt and the chilis – both so full of nutrition. P.S. I followed you on Instagram just now. I haven’t been active in the last week or so, but hope to change that soon. Instagram is great! You should try to be regular and you would soon start loving it!